The moment the world has been waiting for has arrived. Prince Harry looked thrilled when he first saw his bride Meghan Markle, inside St George’s Chapel at Windsor Castle on Saturday, May 19. The bride, wearing Clare Waight Keller for Givenchy, looked absolutely stunning stepping into the church following her bridal party – Miss Rylan Litt, 7, Miss Remi Litt, 6, Miss Ivy Mulroney, 4, Miss Zalie Warren, 4, Princess Charlotte, 3, and Miss Florence van Cutsem, 3. When Harry, 33, caught glimpse of his bride, he immediately teared up. The moment she stepped in front of him, he greeted her with, “Hi,” and couldn’t take his eyes off of her. 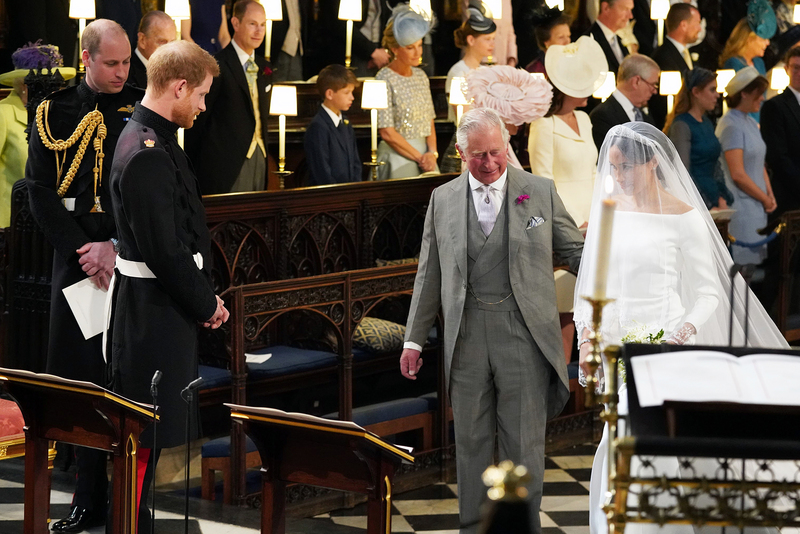 After entering the church alone, she was joined by her fiancé’s father, Prince Charles, whom she asked to walk her down the aisle. On Friday, May 18, Kensington Palace announced in a statement that the actress had requested His Royal Highness The Prince of Wales to give her away since her father, Thomas Markle, could no longer be at her wedding after undergoing heart surgery on Wednesday, May 16. Before his surgery, Thomas also seemingly staged paparazzi photos earlier in the week, causing the Suits alum to become “hysterical” over the scandal, a source close to her told Us Weekly. However, she was still very “upset” that he couldn’t attend her big day. “She hates that he is so far away,” the insider added.